Smiling faces playing tambourines on the deck of a sailboat in the southern city of Aswan are a staple of Egyptian official tourism promotion videos. Aswanis, and Nubians in general, are renowned for kindness and hospitality, and their native land, Nubia, which straddles the Egyptian and Sudanese border, is home to breathtaking nature, wondrous pharaonic temples, and a rich history, during which Nubian kings extended their rule to the entirety of Egypt. But when two dozen young Nubians marched in the streets of their regional capital, playing the exact same tambourines, singing those very traditional Nubian tunes—along with songs about their forced migration—they were promptly arrested on charges of “incitement to protest, protesting without permit, owning leaflets, violation of public security, disrupting traffic, and foreign funding,” according to Nubian activist Tarik Yehia. Though they were to be released on bond pending their trials, vindictive prosecutors appealed the release, renewing their imprisonment for an additional 45 days. The protest, another in a series of activists’ attempts to garner attention to the cause of the Nubian right of return, was held on the sixth anniversary of the iconic 2011 sit-in in Aswan. Meanwhile, seven people protesting their detention were themselves arrested, and a group of Nubian activists declared a hunger strike. The history of Nubian dispossession traces the history of the 20th century. Nubians were forced to relocate from their homes in 1902, with the construction of Aswan Low Dam. The dam was raised twice, in 1912 and 1933; with it, additional waves of Nubians were displaced. 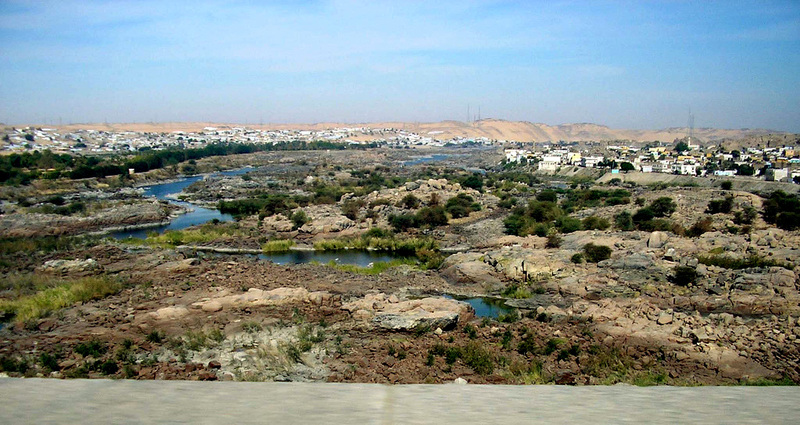 This culminated with the construction of the Aswan High Dam in 1963–64. Ahead of the construction finalization and the filling of the water reservoir behind it, the Egyptian government, with the support of UNESCO, deconstructed and rebuilt the pharaonic temple of Philae, which sat in the flood zone. The homes of the inhabitants, however, were not rebuilt. About 50,000 Nubians, whose economic and cultural life centered around Aswan and the Nile, were relocated 50 kilometers north, near the city of Kom Ombo; they now number 90,000. Their new homes, cheaply built by government contractors, failed to take into consideration the ecological and meteorological conditions of the desert, unlike their ancestral homes, which were built in harmony with their ecosystem, using local materials and appropriate design. For the first decades after their displacement, Nubians largely remained silent. The political climate was inhospitable for dissent, and the Nubian community was fragmented. Many Nubians felt they had sacrificed—or been made to sacrifice—their homes for a national development project, and went along with the prevalent narrative of Egyptian nationalism. But this Egyptian nationalism failed to include and recognize minority rights and regional specificities. “Nubians are not generally treated as equal members of society,” stated an International Labor Organization report from 2009. Nubian language instruction was forbidden in the schools built in the villages “in exile” in Kom Ombo. Nubian demands have never been secessionist or exclusionary in nature. But successive Egyptian governments have been “othering” Nubians for decades, reflecting the country’s signature neglect of geographic peripheries, its security lens for dealing with issues and people near border areas, and its subordination of economic development and human rights to security concerns, real or perceived. These factors have made advocacy for Nubian rights and the right of return nearly impossible for a long time, with just a few instances of audible claims here and there. Nubian mobilization rose steadily during the 2000s. In 2005, Nubian poet and activist Haggag Oddoul addressed a conference on Washington, saying the treatment of Nubians in Egypt amounted to ethnic cleansing—which attracted considerable attention locally, not all of it positive. In the following years, the newly established Egyptian Nubian Association for Lawyers and the Egyptian Center for Human Rights filed a number of legal complaints pertaining to Nubian rights. In 2007, Nubian human rights defenders formed a coalition called the Nubian File Follow-up Committee, an informal entity that had come to be recognized by the Aswan government. In parallel, the rise of national protest movements, primarily focused on economic conditions, gave an added momentum to Nubian rights. The zephyr of freedom that swept Egypt after the January 2011 revolution did not spare the south of the country, which witnessed a growing and emboldened protest movement, while conferences were organized domestically and overseas openly discussing Nubian rights. A sit-in organized in front of the Aswan municipal complex in September 2011 lasted several days before it was broken by police forces who arrested three protesters, then released them on the same day. In 2016, the “Nubian right of return” caravan twice attempted to reach and stage a sit-in at the Nubian village of Forkund, whose land has been designated as falling within the area of a new government development project and thus possibly sold to investors. On both occasions, authorities prevented members of the caravan from reaching the village. The Egyptian political leadership chose to nonetheless ignore these demands, doubling down on its trampling of Nubian lands and rights. In 2014, Presidential Decree 444, subsequently rubberstamped by the House of Representatives, designated large swathes of the Nubian homeland as closed military areas. And in 2016, the president issued Decree 355, which designated land for the new Toshka development project­—much of which, such as the village of Forkund, is Nubian land. These two decrees are now a lightning rod for Nubian grievances. Since the drafting of the Constitution, the government has given no indication that it would cease to perceive Nubia foremost as a security concern, or that it would work in favor of Nubian rights; Decree 355, as well as the repression with which protesters have been routinely met for years, suggests so. The Egyptian government has failed to uphold its constitutional duties toward its southerners—in their capacity as citizens in general, and as Nubians in particular. The arrested protesters may find themselves facing heavy sentences if the government feels any pressure from the Nubian movement, but until the state has clearer plans for the Nubian lands it intends to close off—including guaranteed funding or investment for projects—it is unlikely to escalate the fight against the native populations and will maintain a stern but malleable position, potentially making occasional minor concessions to Nubians. The sustained, albeit sporadic, expressions of protest are proof that ignoring the issue of Nubian rights is an inevitably failed policy, and activists have been considering alternate options to pressure the government. In September 2016, a Nubian rights conference titled “Return is a Right” had concluded that should the state not address Nubian grievances, they would seek the involvement of international courts. This remains unlikely, and there are no guarantees that such a gambit would pay off. Advocacy, however, remains a powerful tool, both internationally, to highlight the minority plight of the Nubians, as well as locally, vis-à-vis the Egyptian general public, to educate a populace that has proven both ignorant and insensitive to the injustices suffered by their southern compatriots. It can also help gain allies and prevent the government and its media to capture the narrative about Nubian rights. Nubian rights are an indistinguishable part of the rights of all Egyptians. Attempting to silence them, and protesters, is a crime that should not be allowed to pass.